Select a category to view related services. Whether you're winning club races in the twisties or dominating your bracket a quarter mile at a time, your car's suspension needs to be an asset, not a liability. There are enough options and parameters in a modern sports car suspension to keep even the most grizzled race veteran up at night. The Gator team is committed to helping you find your "magic number" by either tuning your existing suspension system or augmenting your existing setup with high performance components from today's leading manufacturers. Tire and wheel setup will have an enormous impact on the way your car rides, corners, stops, and accelerates. These characteristics are only amplified on the track. Your Gator service professional can help you chose the right wheels and tire compound for your application. Using the most advanced Hunter Engineering Roadforce balancing equipment available, Gator will collaborate with you in bringing the maximum performance out of your vehicle. From mild to wild, the Gator Motorsport team is ready to assist with building, rebuilding, or performing a full engine conversion to provide your car with the power solution to fit your needs. Whether it's internal engine modifications or external accessory components, the Gator Motorsport team will work with you to create a unique performance program to suit your application. There's a reason why they say "Brakes make you faster"! 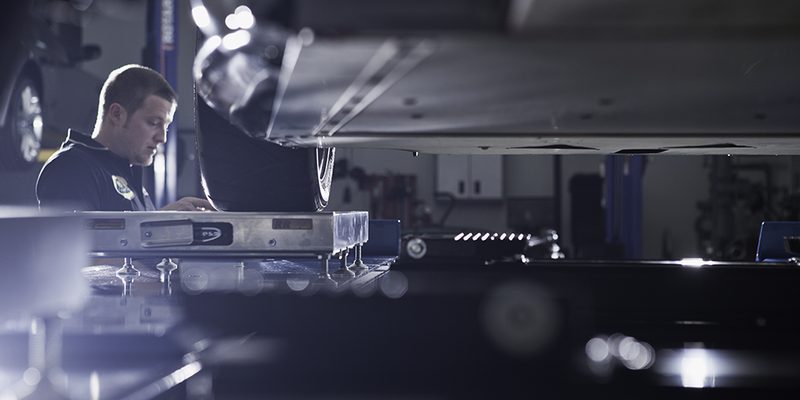 Your braking system is a critical component of any track or race prepped car. It's necessary to insure that your brake system is capable of handling the additional straight line and cornering speeds that come with power and suspension upgrades. Coupled with the appropriate tires, a brake system upgrade can often surpass even today's modern Sports and GT car OEM systems. High performance engines are essentially massive air pumps. An engine's power output will ultimately be restricted by its ability to draw upon clean, dense air. By increasing your car's ability to draw in larger quantities of cool, dense charge air, you can unleash the true potential of your engine. We suggest balancing and matching an aftermarket performance intake system with the correct engine management software and exhaust system to take full advantage of increased airflow. Exhaust systems are one of the most misunderstood and incorrectly implemented aftermarket components for high performance cars. By carefully and thoughtfully managing the flow of exhaust gasses, heat generation, and weight, exhaust systems can not only provide increased performance but can deliver the "bark" commensurates with the "bite". The Gator Motorsport team is here to assist you with selecting the best balance of performance, sound, and cost for your on-road or off-road application, from simply helping your car find it's voice to complete straight pipe and by-pass systems. A modern sports car is a complicated array of mechanical, electrical, and computer systems. Your vehicle's ECU and engine management software insure that these systems work together seamlessly to provide the highest levels of performance. As different systems are modified or upgraded, your vehicle's control systems may need to be upgraded to take full advantage of those changes. In some cases, additional power can be unleashed by simply installing software upgrades that trade reliability margins for performance. Gator Motorsport can install aftermarket software packages or provide unbiased consultation to help you find the right software for your application. Your brakes are a critical component of your vehicle's safety and performance systems. Brake systems performing less than 100% can lead to increased stopping distances, pedal vibration, steering pull, and diminished control of your vehicle. Gator Motorsport can assess, repair, and maintain your vehicles entire braking system to ensure that the performance you count on will be there when you need it most. Nothing will ruin the enjoyment of your high performance or luxury vehicle faster than a slipping clutch, grinding gears, or harsh shifts. Gator Motorsport can provide expert diagnosis and repair of your vehicle's drive components whether it is a front, mid, or rear engine configured drivetrain. Regardless of what type of vehicle you drive, the Gator Motorsport team can insure that it drives as well as it did when it left the factory. We don't believe that "drives like new" is a cliché but rather, an expectation. Let our team evaluate and adjust your vehicle's systems so that they are operating and performing to their original specifications. Gator Motorsport provides a full range of diagnostic and repair services to suit our client's needs, regardless of make, model, or vintage. Through a combination of visual, auditory, computer, and on-road inspections, we will determine the cause of any fault or failure and provide our clients with various options to meet their needs. Gator Motorsport takes great pride in providing a truly consultative approach to vehicle service and repair. Over time, your vehicle's suspension components will wear and change causing loss of ride quality, reduced control & performance, and that tell-tale steering "pull". 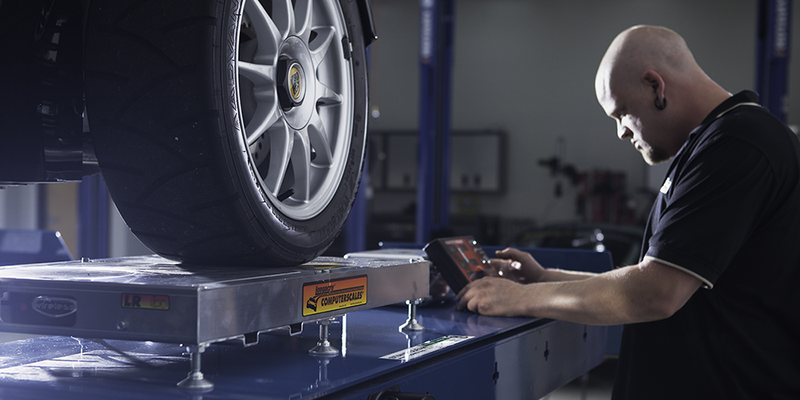 Gator Motorsport has invested in state of the art alignment and suspension equipment, like the Hunter Engineering Hawkeye Elite alignment system, to keep your vehicle on its toes and riding true. A properly operating suspension system will insure that your vehicle is providing the ride quality and control you demand. We understand that keeping your car shining is a true labor of love. Let Gator's Detail & Appearance team keep your exotic investment looking better than showroom new. Our detailing bay is enclosed, secure, and dedicated to the sole purpose of providing the perfect environment to guarantee a concourse quality result. The lifeblood of every automobile. Whether it's replacing the 14 quarts of oil in your Aventador's screaming V-12 or giving your BMW M Series car it's dose of specially formulated Castrol TWS, let Gator Motorsport help keep your hands clean! The Gator team will visually inspect old oil, filter element, and related components and provide feedback should any concerns arise. Oil analysis services are also available for the ultimate peace of mind. We are also happy to discuss oil and fluid maintenance schedules and create a program that best fits your needs. Gator Motorpsort prides itself on providing top-notch service for both track and road driving. Whether you need someone to give your everyday car the white glove treatment or tune your race car for the highest performance, we've got you covered. Please choose a side above to view the services that we provide.